This image was taken way back in the summer of 2005 in Newquay. My wife and I had joined the fledgling St Agnes Gig Club and we rowed and raced out of Newquay Harbour several times a week. The protection afforded by the granite harbour walls meant that we could launch the gig at high tide, sneaking out behind the breakers. As the tide dropped, fishing boats moored in the harbour would be left high and dry and this image is of one such boat. Although this is not the earliest image in the collection it is the one that concentrated my mind and and formed the idea of a project focusing on the hulls of boats. I’ve always been been drawn to texture in images, I like geometric lines too, and this image combines both. I had it printed on canvas and it hung in our hallway in St Agnes for several years. Many people commented on it and all were surprised to hear it was a photograph. I was intrigued that I’d managed to make a photograph that looked like a painting …… the opposite of photo-realism in painting. 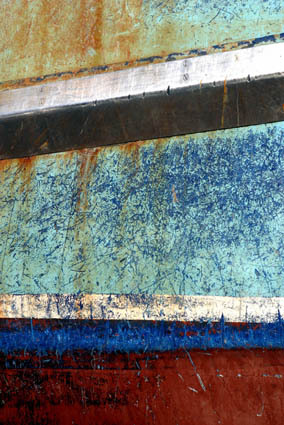 The complex “brushwork” had been caused by countless fishing nets and lobster pots being hauled aboard, denuding the paint on the hull’s surface and polishing the stainless steel strip near the top. The resulting image was a narrative of the working life of the boat. This entry was posted in Fine art photography, photography and tagged alstonville, ballina, bangalow, Beneath the surface, bexhill, byron bay, eltham, fine art photography, fine art prints, fishing boat, gonellabah, images, lennox head, lismore, Newquay, northern rivers, photographer, photography, wollongbar. Bookmark the permalink.